A few weeks later, her mom stopped by and chatted with me while our daughters played again. Though I’d talked with her a handful of times in our four years on Wisconsin Street, this was the first time we’d talked in depth. In early July, my husband and I found out we were expecting a baby at the beginning of March. A new season…a new hope, and we were so excited. I took a belly shot right away, started watching everything I ate, was getting my workouts in…I was trying so hard to make sure I did everything right. We couldn’t wait to welcome this new little one into our lives. Then, just a few weeks later…it was over. At first there was the shock. The grief. The tears. The normal things that come with any loss. But then came the wondering. And the questioning. Why, God? Why would you give us this little one to love for only a short season? To be honest, as I pound out these words just a few weeks after we lost our sweet one, I still don’t have an answer. I might never have one. But I do know, even as I look back at what He has taught me through many years of transition…from the unexpected adventures that took us to parts unknown to the beautiful bliss of calling a place home…is this. Sometimes we dream big and we chase wildly, and those dreams still don’t happen. In those moments, it’s so easy…So. Very. Easy…to doubt. To question. To wonder what His purpose may have been in all of it. Because the hard Truth? Is that there is always a reason. A lesson…to help us grow in Him. A promise…to remind us of His goodness. 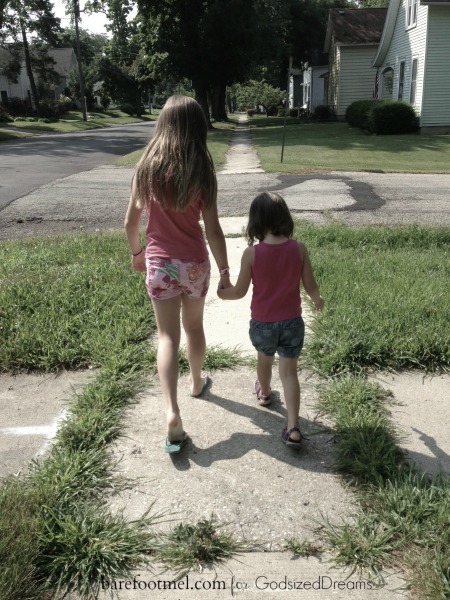 So my heart still feels that little pinch when I see my daughter walk past her friend’s house and talk about how much she misses her. Sometimes she cries. And the ache resurfaces when I think of my empty belly and the life we so wanted in our arms…but the one that is now safe in Jesus’ arms instead. And sometimes I cry, too. And a sweet sadness comes when we remember what’s been…and might never be again. And, oh, how the tears flow. But we do know His promise. Sweet dreamer, I don’t know where you are in your dreaming today. Maybe you’ve felt the sting of rejection or the pain of loss. Maybe you’re struggling with unanswered questions or doubting because you just can’t see. Maybe you just don’t understand the season He has you in. How can I pray for you and the season of your dream today? May God bless your steps in that wonderful dream, Margie!! Amen and amen!! I’m thanking Him that you know from where your peace comes. May this season be short, but full of blessings beyond compare. I know God has taken you on such a journey lately, friend. It makes me smile to hear that He’s doing so much in your heart…I can’t wait to hear more about it! 🙂 Hugs and prayers for you! Beautiful post. Tears streaming. Not for myself but for a loved one in the midst of a season of loss & unanswered questions. This post made me realize so much — to everything there IS a season and a reason. It all is a part of His working in our lives. Praying for God to bless you greatly in this season and in the coming one. As I prayed for you, I was reminded that we will soon experience a change of seasons 🙂 And so it is with our lives. Seasons change bringing new life, new promise, new growth and deeper understanding of our God, Who Alone changes them. Blessings! And thank you for sharing this post! Thank you, Joanne…and I’m saying a prayer today for your loved one. The fact that God has a plan…and He always does…is something I have to tell myself every day. I know it, but most days I have to cling to what I know because I just can’t see. Praying for those new seasons and the Hope they will bring. 🙂 Blessings to you, friend…I’m so grateful for your prayers. Since I thought God gave me His dream, so much has happened in my life that I’m not motivated to work on my book. I’m not even sure any longer if its His dream or not. Thanks for your prayers. What a blessing to see God working in you during these changing seasons. I pray that He comforts you in this time. I, too, am in a season of change but an exciting one. I am looking forward to see how God works it all out. Thank you for your prayers. What a beautiful, true post, Mel. You’re right that there is indeed seasons for everything, even dreams. I’m sorry you’ve been in a hard season. God’s doing something glorious, though, even when we can’t see it. XOXO. Oh Mel, I walked such a similar path but a number of years ago. I know His plans for your family are good–not always easy and not always our first choice but always, always good. One thing I can promise: in time you’ll gain God’s perspective and you’ll have a deep understanding of this season in your life. Thank you for sharing so honestly with all of us. I’m praying He brings you much comfort as your words bring comfort to so many. Hugs! I love what you said about gaining God’s perspective…yes. That’s what we hope for in this…to see how good His plan for us has always been. Thank you so much for your prayers and sweet encouragement, friend…I’m so grateful. 🙂 Hugs back! I think, in those relationship moments, God-seeds are planted that He knows we will use in the future. We lost a little girl half-way through a pregnancy – She’s in heaven – and one day we will give each other a big, long hug – but through her loss, I think my heart opened to reach out to the motherless. When is it a God-seed? I think when the feelings are intense and seem to go soul-deep! Yes – God wastes nothing!